Anyways, today another friend of mine shares her wedding story and I coudn't have been happier. Priyanka also happens to blog under Corporate Kettle and submitted this post on a very short notice on my insistence. Thank You Priyanka, I owe you big time. Thank you for sharing your special day with So-Saree Readers. Marriage is a sacred fellowship that unites two souls. It’s the most important day in a person’s life. Especially for a girl, marriage indicates the beginning of a new life. As a child, marriage was a fairy tale story and I would imagine myself dressed in a beautiful flowing white gown awaiting my prince to take me away. As our story books always had these images resembling a Christian wedding. 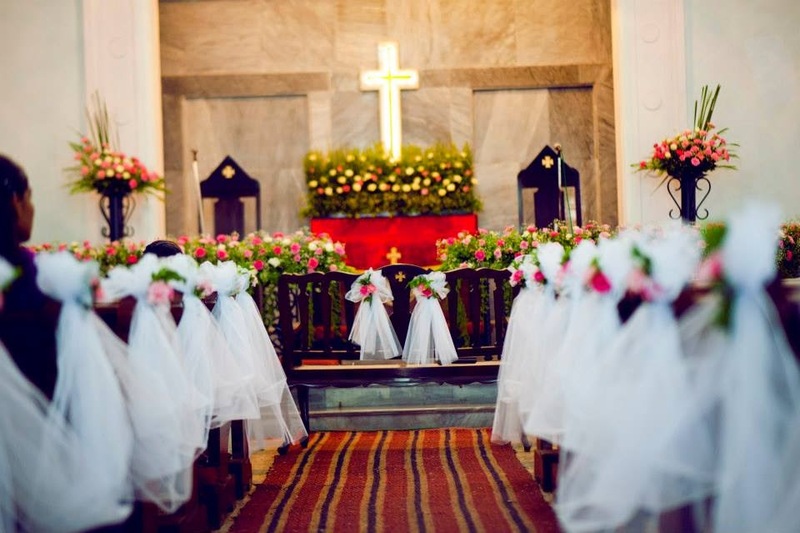 The church ceremony, often termed as ‘nuptials’ begin sharp at 4 p.m. followed by the reception at 7 p.m. Before the big day arrives, there are too many preparations involved. Firstly we need to get the church choir ready for the main day. They are the heart of the ceremony. They lead all the weddings hymns and most importantly add life to the service. 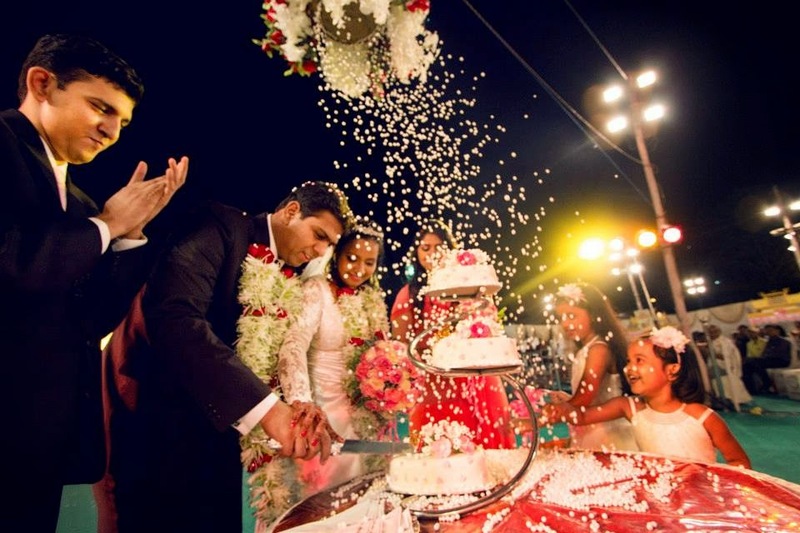 The choir needs to be well versed with the hymns and activities that will follow during the Holy Matrimony. 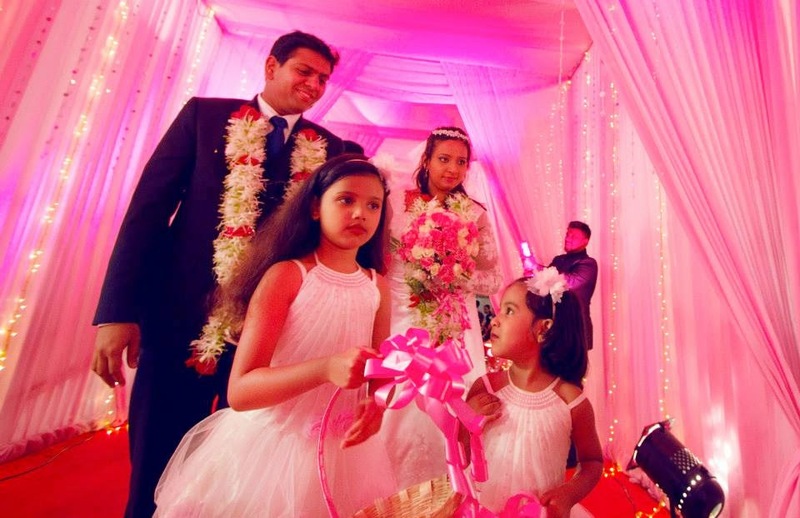 Then the page boy, flower girls, best man, bridesmaid all have to be vigilant about their roles during the ceremony. My husband arrived along with his parents and best man before the scheduled time and took his position near the altar. The groom has to wait inside to receive his bride. Then the priest entered and took his position at the altar. He requested the congregation to arise and welcome the bride. After the priest it was the Page Boy’s turn. 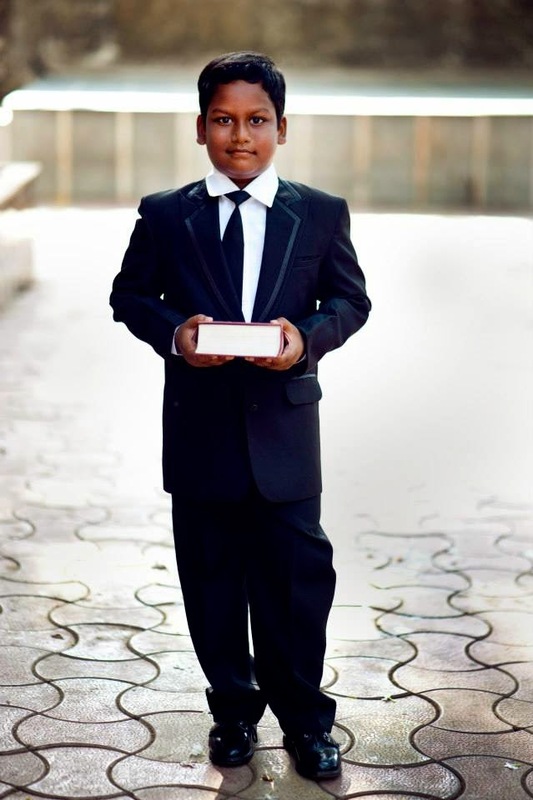 His role is to carry the Bible and hand it over to the priest. 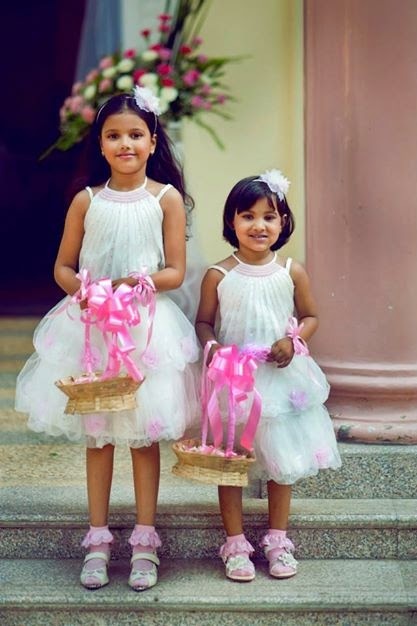 The flower girls entered next. 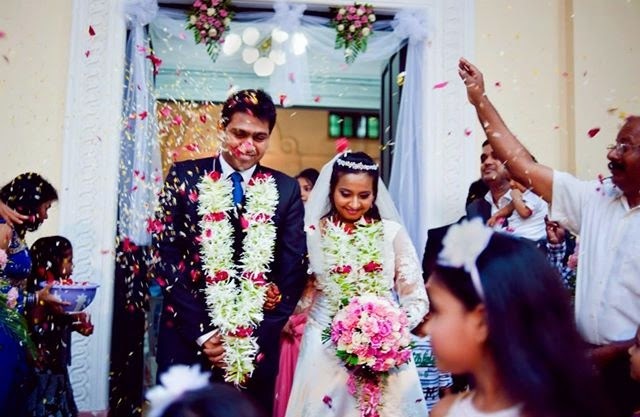 As they walked, they dropped flower petals on the floor preparing the walkway for the bride. After the flower girls, it was the bridesmaid turn. My sister was the bridesmaid in my wedding. This place is given to a close friend or relative of the bride. 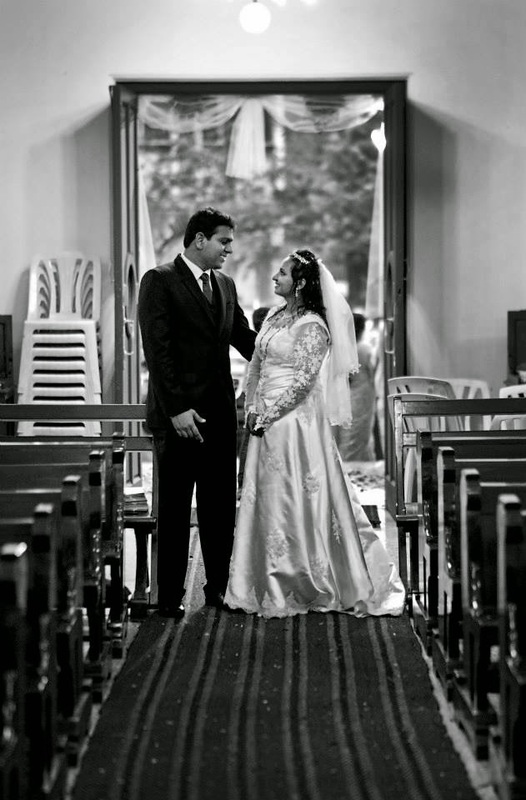 She entered the church and took her position near the altar. While all these events take place, the choir leader (the one who usually plays the piano) plays a hymnal in the background. Finally it was my turn. I was walked down the aisle by my father to the tune of ‘Here comes the bride’. 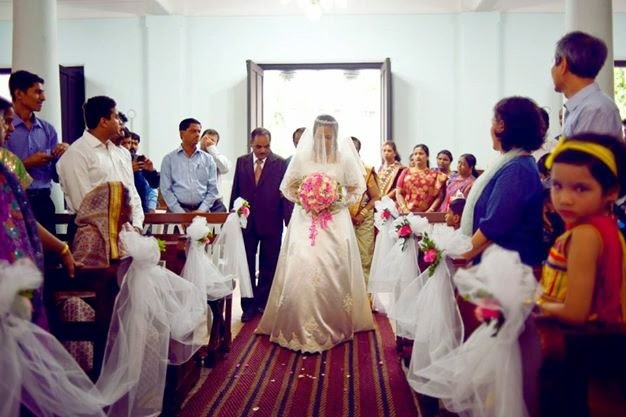 This is called the wedding march which is a slow walk towards the altar. The service began, with a hymn followed by a prayer. Then the priest asked us to stand as he was about to solemnize the wedding. He asked the congregation if there were any legal issues or reasons why we shouldn’t get married and if anyone had any objection about the wedding taking place. This practice is often done to verify if the boy or girl are single and not secretly married or are having any legal issues like not yet divorced from first wife, does not hold any church membership, not a Christian, etc. If there is no response from the crowd, holy matrimony begins. Our wedding was solemnized by the Bishop. He is the highest authority in a Christian society. The Bishop asked my husband if he was willing to take me as his wife and a similar question was asked to me as well. The most important part of a Christian wedding is the exchange of vows. These words form the covenant that establishes the couple’s marriage. The Church calls the exchange of vows, consent—that is, the act of will by which a man and a woman give themselves to each other. The marriage can’t happen without the declaration of consent. 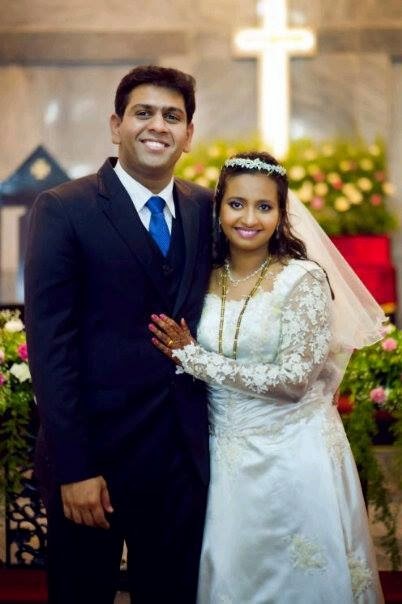 The priest asked us the following question - I, (name), take you, (name), for my lawful wife/husband, to have and to hold, from this day forward, for better, for worse, for richer, for poorer, in sickness and in health, until death do us part. 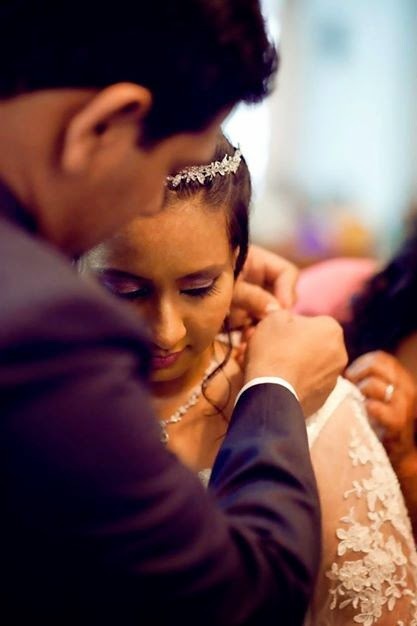 Once our consent was received, we exchanged rings and my husband tied the mangalsutra around my neck. Thus we were pronounced husband and wife by the priest and our wedding ceremony ended there. 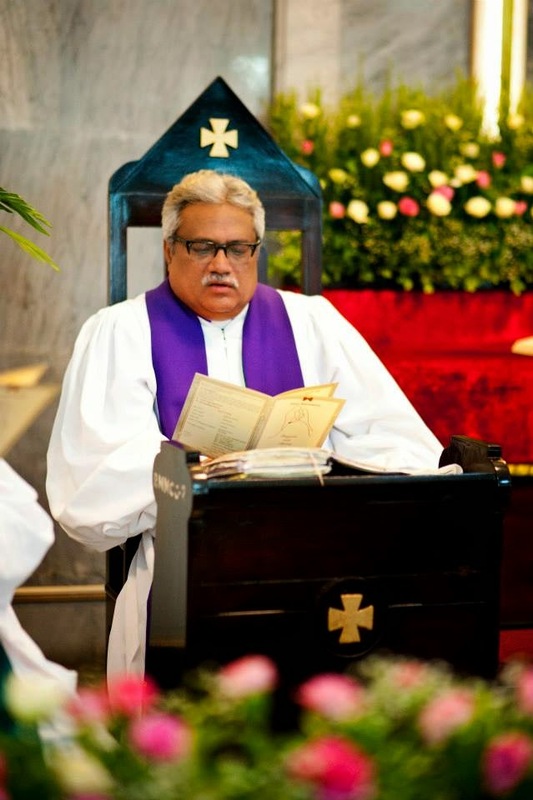 The Bishop delivered a sermon, which is traditionally followed in every Christian wedding. He wished us good luck and spoke few words of wisdom for a healthy married life. Post the sermon we headed to sign the register. 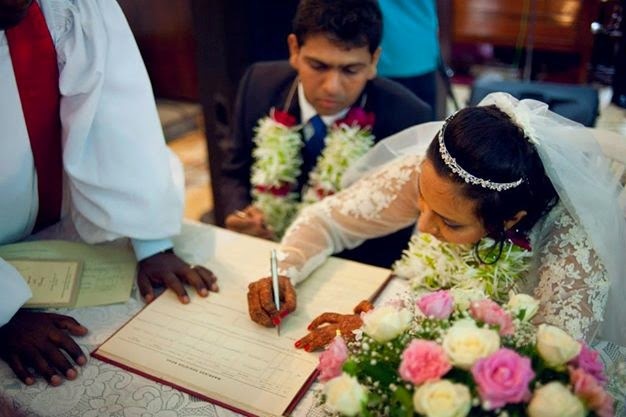 The church issues a certificate of marriage which is considered as a valid document and a proof of our marriage. We both signed on it along with one witness from each end. Finally the ceremony was over. 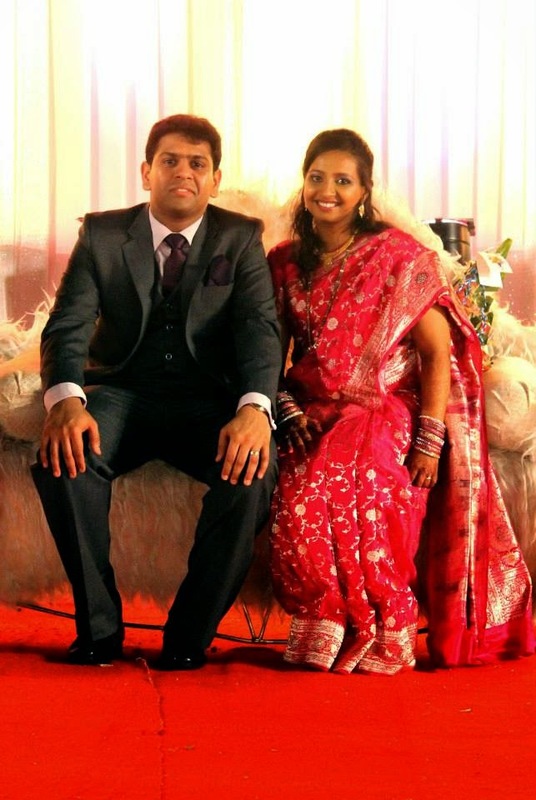 We clicked snaps with the dignitaries and walked out of the church as husband-wife. The crowd wished us and showered us with blessings in the form of flower petals. The Master of Ceremony welcomed us as we entered the reception ground. The crowed showered confetti’s on us. We were brought in the middle of the ground where the bridal march would take place. 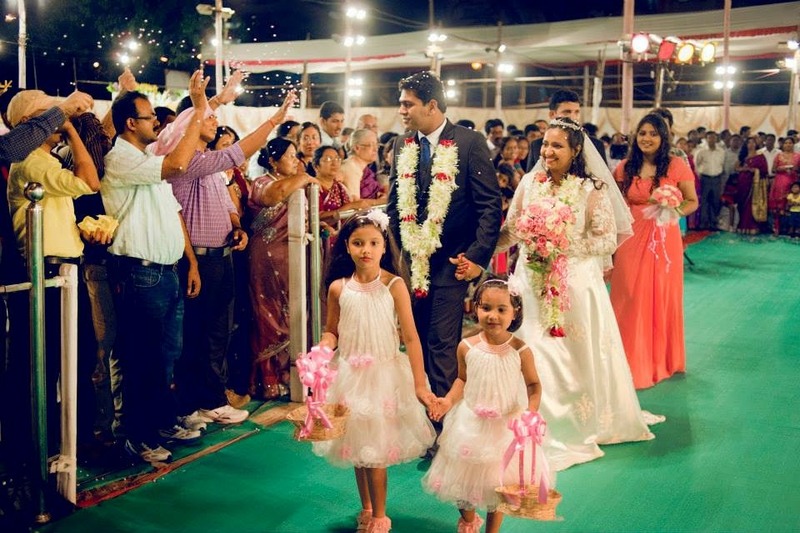 All close friends and family members were asked to join the bridal march. It’s more like a fun walk where everyone is following the bride and groom. 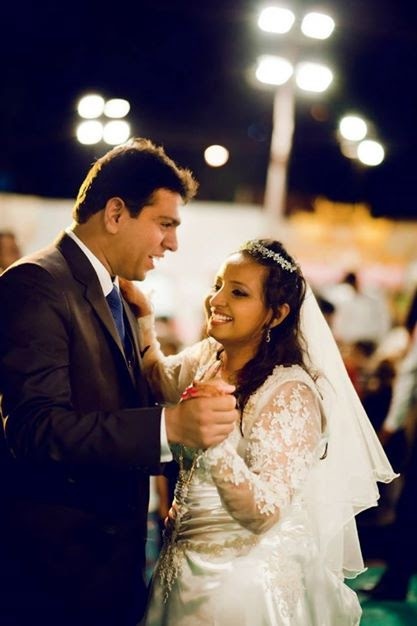 It was time for our first dance together as husband and wife. The crowd was encouraged to join us again. A romantic song was played and everyone danced along with us. I danced with the best man, my uncles and cousins. The groom takes this opportunity to dance with the bridesmaid, his mother and sisters as well. Post this was the cake cutting ceremony. During the ceremony both the families were introduced. After the cake cutting my husband’s eldest uncle raised the toast for us. Usually a person who is very close to the boy’s family has the privilege of raising the toast. Cake and wine is offered to everyone for raising the toast. Finally I changed into a royal pink colour saree. Dinner was served, dance floor was open and people were invited to wish us on stage. Post the celebration we sat together as a family for dinner along with relatives and close friends - all waiting to bid me goodbye and wishing me a happy married life.